Rockstar Punched is a juice and energy drink hybrid from Rockstar Energy. 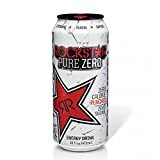 8 Pack - Rockstar Punched Energy + Punch - Fruit Punch Flavor - 24oz. Sugar content: 62 grams (per 16 ounces). How Does Rockstar Punched Compare? Rockstar Punched contains 15.00 mgs of caffeine per fluid ounce (50.72mg/100 ml).